64 pages; Dimensions 10.0 x 8.0 in. A is for seed, B is for eggs, C is for milk--what's going on here? Well, the seed is tomorrow's Apple, the eggs are tomorrow's Birds, and the milk is tomorrow's Cheese! 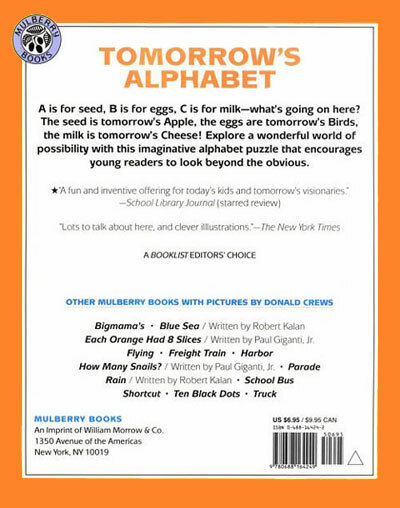 Explore a wonderful orld of possibilities with this extremely unique and imaginative alphabet book that encourages young readers to look beyond the obvious. A fun and inventive offering for today's kids and tomorrow's visionaries.  Using a topic of study, make a classroom book using the book's pattern. Brainstorm several important concepts related to that topic to help prompt your thinking. 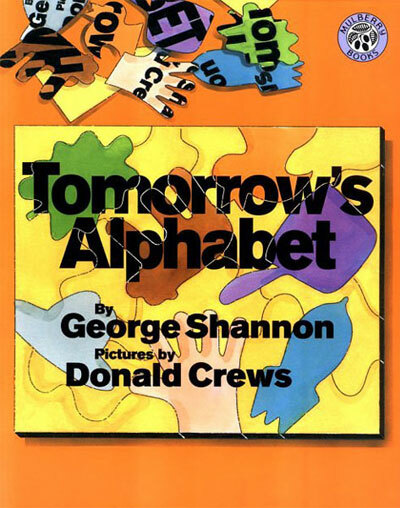 Then, choose a letter of the alphabet to write and illustrate a page of the book. For example, in Tomorrow's Thanksgiving Book: "C is for stalk, tomorrow's corn." *REPRINTED FROM: Kingore, B. (2012). Bertie's Book Notes. Austin: PA Publishing. George Shannon grew up in a home filled with books and family stories. He spent years as a children's librarian and professional storyteller. He feels, "The challenge of sharing a story in as few words as possible and with a vital theme inside a 'light-hearted' plot is one I sense I'll always enjoy as surely as I do reading." Donald Crews is the renowned creator of many celebrated children's books, including the Caldecott Honor Books Freight Train and Truck. He and his wife, Ann Jonas, live in New York's Hudson River Valley.